My son is a teenager, and spends most of the time in his room. He's usually on his computer, his PS4, or his WIIU. Sometimes I feel like I never get to see him. So I come up with ways to ensure I'll get a glimpse...and maybe even a conversation. 1. Lure him out with food. Teenage boys seem to ALWAYS be hungry. You'll watch in awe as he polishes off an entire bag of chips...and then claims he's still hungry. But it's okay, because you get more time with him. 2. Bring him to a place he enjoys. Tommy has autism, so he loves trampoline places because it gives him the stimulation he craves. He'll bounce and bounce and bounce. He prefers to go when there aren't a lot of people so we take him when it first opens. I bounce with him and have an out-of-breath conversation, because I'm out-of-shape. So I'll say, "How....are.....things........going?" And he'll actually ANSWER me! However, when I bring him to the store, he's sullen and only says things like, "Can we go home now?" 3. Ask him about his Minecraft village. Subtly say things like, "So, you love all the dogs in the game...do you love anyone at school right now?" 4. Offer him food. I know. I already mentioned this. But it works. I promise. "Tommy! Donuts!" And then you hear a thunderous noise, because your teenage son has big feet, and he'll appear! Voila! 5. Bond over subjects you agree on. For instance, my son and I agree that a lot of the music of today hurts our ears. We prefer music like "We Built This City" and "Thriller." .....even if I do have to lure him out with food 90% of the time. Lmao. It's interesting how men never change. The best way to lure Military Husband away from the PS4 is food also. I wish we had a trampoline place here. I love to bounce. Aw! I'm right there with you. I want to yell, "Remember when I was your favorite person too?" My son loves pop (aka soda for those of you outside the midwest) so I'll sneak a can home and promise it to him. He goes bananas and thinks I'm cool for 5 minutes. I'll take it. Girl I feel you. My 15 year old only talks when food or video games are present. It's so odd to go from the center of their world to barely getting 5 second notice. Ha. I love it. My boys are not that old yet but they sure do love food already! LOL! Hahaha food is always a win! Good will lure any male out! Haha. Looks like your son and I would pick the same pace to enjoy a day. TRAMPOLINE GALORE! Mine craft is a smart subject together him talking, maybe join in (even if it's totally un-cool for a mom to do). A WIIU? Never heard of that system. Is it similar to the wii? As a child care provider, one of my clients has a 5-year-old autistic boy. He's such a doll and I love interacting with and teaching him! Your son is adorable! I hate that I can't edit a comment..
Ok, I love this post because I constantly have to remind myself that one day my two boys won't be latched to me every second.. and won't constantly be like "mom, mommy guess what? Hey Mom. Mom." and I will miss it. Because right now it drives me nuts!!! I am trying hard to enjoy them being little since I know it goes by fast. Take him for a car ride. Mine talks in the car with me. Good advice! When my son, Adam, was 15 and I started to talk to him, he almost always responded with, "Mom, is this going to be a meaningful conversation. I can't do meaningful right now!" 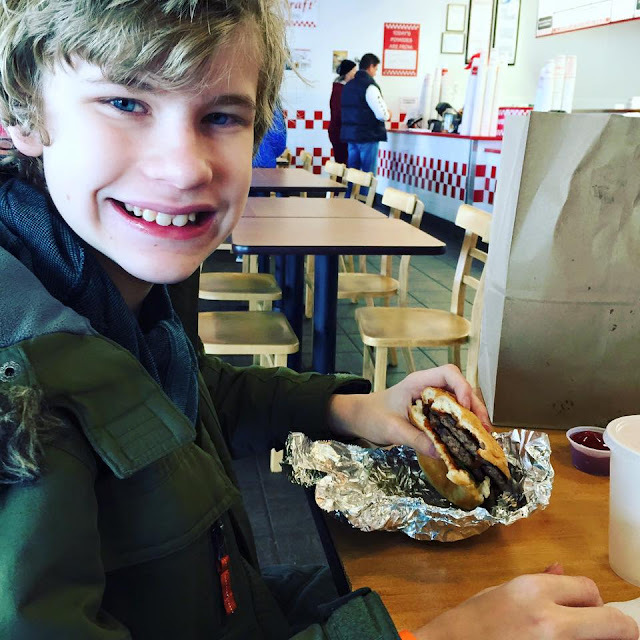 I might have to try the food thing with my tween. He likes his room a lot. Though I can also lure him out by telling him that he and I are going to go do something without his brothers. He loves that. Hahaha, this is awesome! I employ a lot of these tactics with my son too! Especially, the food. You are right, it always works! Okay, food. Got it. My son's not there yet, but I'll file this away for future reference. Thanks! Oh so true. Girls are almost as bad, although they tend to like to whine and fight more...so there is a little more peace and quiet with teenage boys, I'm guessing! These are GREAT ideas! 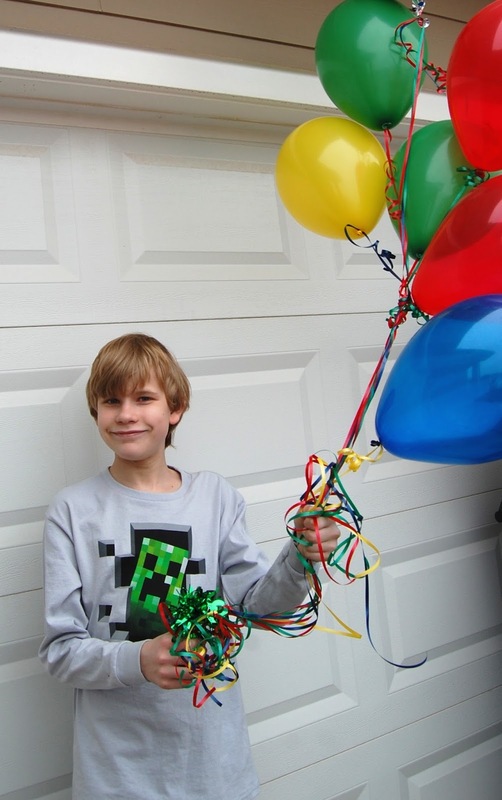 My son just turned 16 today and we are all super busy all of the time. SO it is so good to take time to stop and make sure we get those conversations in there! I wonder what causes them to go practically mute when they hit their teens?? HAHA I'm sure I was the same way with my mom at that age! Although instead of food, it would have been shopping! Cute kid! Glad you at least have food, trampoulines, and Minecraft. My son was like that too. Now he's 24 and we actually have long conversations on the phone. He'll come back around. I've been through this twice! It seemed like they always wanted to talk at night when I was exhausted and ready for bed. My 18 year old is still pretty quiet, but my older son talks my ear off now. Food is definitely the best way to get them out of their room! I teach kids Grade 7-9 with Autism. We sometimes play Minecraft together, using a server, and we can type messages to one another within our little village, on the screen. Even though I am sitting in the same room with them, typing a conversation within MineCraft has worked wonders! How cute is this?? Great post! Forwarding to my sister to read...she's a mom to a teenage boy! You can lure me with food too. :) This was a fun post, thanks for sharing with us. What an amusing post! So realistic, yet optimistic. Looks like you and your son have a great relationship - even if you go through growing pains sometimes. I think you could lure me into a conversation with food too. I know someone who would love to try these tactics out on their teenager. I'm a couple of years away from the teenage years, and I will definitely try these ideas. 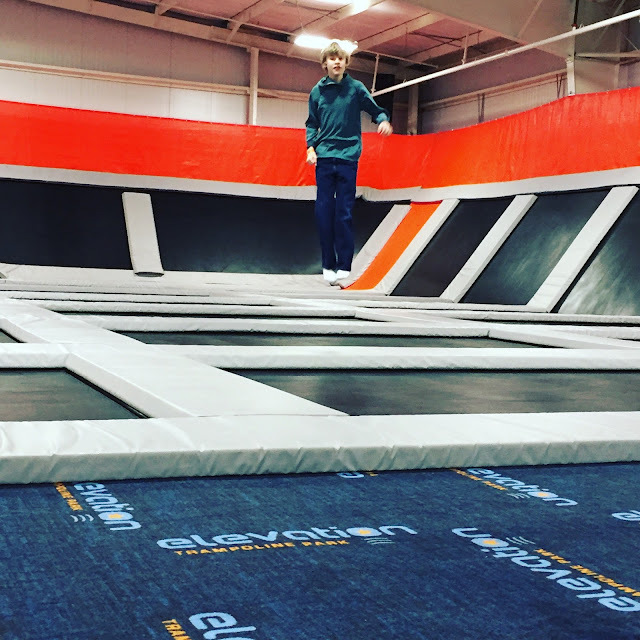 I' a fan of our trampoline parks, so I hope my boys will agree, too! Food and car drive these are the two best things which helps me a lot for good conversation with my son. You have share good ideas that are worth trying. I think we are all this way in many ways nowadays. Everybody with a phone or tablet in their hands while in the same room watching television or eating dinner. Nobody hardly communicates anymore. It's sad. My son isn't quite a teen but I am already struggling with this. Will apply all of these to real life! It is very true that teenagers are glued to video systems. I don't like them, but know that most will have them. I do find it humourous that food is a lure. I have seen that before as well. Lol! I don't have kids yet but my brothers are teenagers and I know my mom struggles in this area sometimes. These tips are certainly helpful and I will pass it along to my mom! HAHA food is way to a young mans heart! It lures them in love that part! I agree show them you are interested in the things they are interested in. Its a way of showing them you care about all the details of their lives even if seems boring or silly to you its huge for them. Excellent advice. It just takes some trial and error to really get them talking. Hahahahaha. It is so difficult, trust me, I know. Food is always a great idea for everything. Mine likes it when we do things together. Preparing food together and yes I've to agree with you that food works every time! Oh gosh I am not looking forward to when my children get older! I am sure they are going to be locked in their room all the time! This was pretty funny! Also, the part about today's music is mostly a misconception. There's TONS of great music being released recently, but you sadly won't hear it in the radio. I recommend you do some research! Getting a Male teenager to converse for a longer period other than in monosyllables is a herculean task. The only way his mouth will open is with food. The trick is to interact with him like a friend rather than as a Parent. Funny and accurate! I love reading your humorous posts. Reminds me of the late, grate Erma Bombeck. This is hilarious, but very true. I will try these out when my son is a teenager. What agood post, I can't wait to my son to become a teenager. Aw, you son is adorable. I love those trampoline places! We had one in San Jose called Sky High and my students LOVED it so much we actually had a family night there. Such a good workout! Hahaha this post is awesome. It's near impossible to get them to talk! My brother and boyfriend's brothers are the same. Food ALWAYS works! Truth post! This is hilarious, teens is known as a food lover lol so it will work any time haha. Did you know this works on tween girls too?? I think food is the big one, she is always up in her room reading a book. The Minecraft one is totally true. My nephews are always willing to talk about their Minecraft village. Offering food is a good tip! My son is 17 and feels like he can pretty much talk to me about anything. We both love video games and movies so we talk a lot about those 2 things. What has worked the best is I just listen. No matter what he is talking about I listen and I make time to do that. These are great tips for getting your teenager to chat more. These are also great ways to bond with your teen and create lasting memories. Haha good one with the food. Honestly female teenagers are exactly the same. The teenager I babysit is the same way. We come home after school and he disappears until dinner or sports practice. I usually check to make sure he's alive, but other than that let him have his space. I know he's at the age where he thinks he's grown and everything involving me or his parents is uncool. Such an interesting topic where we are in a tech dominated world with our kids being so much obsessed with tech gadgets all the time. These are some great ideas which could work out and bring lots of fun too! Thanks for these tips. I'l try them out of my nephew who is also a young man of few words. Oh boy! I'm not looking forward to the teenage years lol Hopefully my son stays like the chatter box that he is now. You must have met my son, lol. He is a man of very few words right now. It's like pulling teeth, getting him to talk! Food always works or the games that they play! These are all awesome ideas! It's tough to get them to sit down and talk. I remember being in this stage. My mom would often bribe me with a movie date and I would gladly oblige. But when it comes to teen boys, she had to try harder with my brother. They rarely open up! BAH HA HA HA HA!!! This is a funny topic - boys are sooooo distracted by everything! 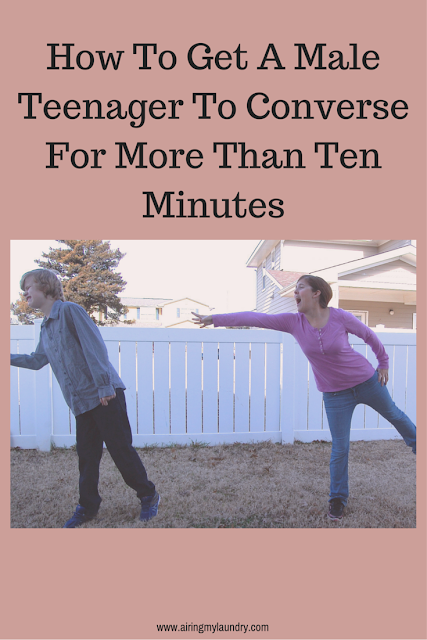 The fact that you got a teenage boy to sit still for all those photos is impressive :) Great post thanks for sharing will pass on to family members with teens. I hated speaking to my Mum when I was younger, I preferred to stay in my bedroom or go out with friends! Yes all of these work with teen boys. In fact, I bet that they work with my grown husband! I loved reading about Tommy. Smart dude to come running for donuts. Food is the way to any guys heart no matter how old they are. I'm glad you're fining ways to talk to him that work. Thank you for these tips. My son is 17 so I know the struggle all too well. Definitely some things to consider helping keep communication going. I will have to try using food lol. Teenagers can be tricky to communicate with. Dinner time seems to be the only time we are all home at the same time. Food works with people of all ages. Something about food just makes people come together and want to chat a bit. Food for the WIN! My son could be lured if I said I was going to a tech place like Best Buy too! These are great and soooo soooo true! This is so cute and some great advice. I think food is always a great way to bring people together. I dont think you can be silent and well feed. I've got a 17 year old son and know just how difficult it is to get teenage boys to converse! Great tips, these! I know what you are talking abput. I have a teen and a tween. It's hard to get my teen to talk to me at times especially when I want. This post got me laughing on how you lure him out with food. These are great ideas on how to converse with a teenage boy. Hopefully good will work with him as well. Hahaha! Yes! My 14 year old is like that, cooped with his computer 24/7. I lure him to run errands with the promise of a meal at his favorite diner. We seem to do most of our bonding conversations in the car. 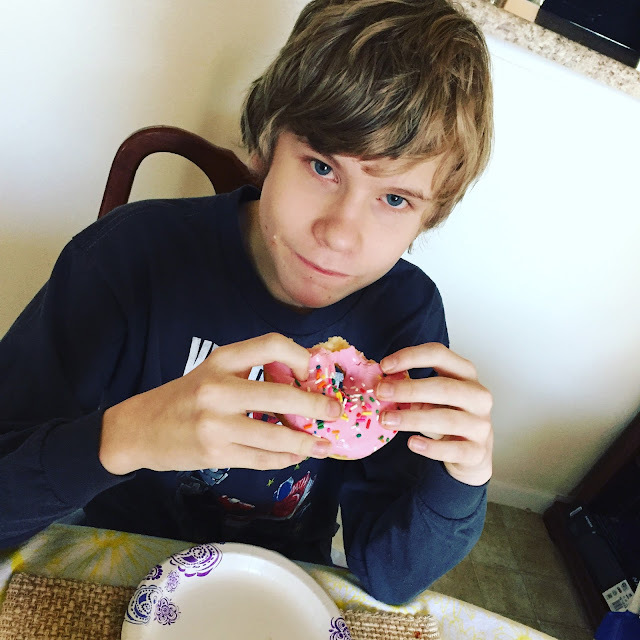 Thankfully, my 13-year-old grandson loves to talk to me and making his favorite foods certainly does help. He's very outgoing and prefers people to video games (for now at least). My 13 year old gets chatty at bedtime. I don't even think it's a stall tactic, but I think his thoughts just don't catch up with him until the end of the day. Get them to talking about their favorite subject. Be it sports, computer games or whatever. Food helps. Little conversations like this help so much! I think it's important that you try your best to lure them out and talk to them. I agree with the food technique. Food is always the answer! It can definitely be hard getting teens to communicate but whip out some food and they'll be chatting up a storm. I can imagine how tough it is to get a male teen to talk! I think these are awesome ideas, I am a believer of how food gets them so easily. Lol. My daughter isn't a teen yet, but I always bribe my nephew with food. Hit him with the hard questions at dessert hahah! I have daughters, and all they want to do is talk! Lol. My best friend has a son that just turned 16, he spends the majority of his time in his room on the computer or playing video games. These are some great suggestions. This hits close to home. My oldest is also Autistic and I find drawing a conversation from him can be like pulling teeth sometimes. I know for sure if I talk about Minecraft I'm bound to get at least a 15 minute convo. Oh boy teenagers... they are so funny! I think a way to their heart and to start conversation is definitely with food! Yes, he's just like any other male, lure him with food! Haha love this! I can still lure my other half with food and he will happily admit it haha! This is a great post. While I have two girls, I will share this post with a friend who has a 15 year old son!! Let them have good food and places they'll enjoy and they'll be talking about it for hours. Keep them happy and they'll be loyal. I’m so thankful my teen still enjoys talking to me. I’ve found ways to make our chats more meaningful. They mean more to me now than ever. Food always works. Lure him with food, love it! I also know for a fact that talking to him about his minecraft will get him talking. I do not have teenagers, but I have a 10, 8, and 6 yar old. They are all about that game! Hahaha! I think food really does help lure him. Once he likes it, you can talk while he is eating. This blog would help a lot of parents with their teenage kids. I mean who doesn't love a free lunch? Your son is so cute. This post is so true. I don't have a teenage son, but I have 2 teenage nephews. It is very hard to engage in a lengthy conversation with them. It seems impossible to get them to talk. But you are right food always works for me as well. So totally agree with luring them out with food. My boys are usually in their rooms but once they smell something on the stove that they love, you'd hear giant thumpers coming down the steps, sit in the kitchen chairs and be the ones to actually start the conversation! Once they hit that age it can be tough. They just like keeping to themselves. Great post! This post was so helpful. My boy just won't talk to me like he used to. Awe, these tips aren't just for boys! I struggle to talk to my daughter now that shes "too cool" for small talk. But I totally agree, food is the way to go. These are some amazing tips. I have been struggling with my preteen a lot lately. I cannot wait to try some of these. Please, I know this very well! I have an 18 year old and I know exactly how you feel! I’m going to use your tips. I had to giggle at this post. Food and donuts are always my go-to attack plan as well. This made me laugh, I think most teenage boys parents need these tips! I think food must be a winner! Hope they al work! I can imagine that most teenage boys don't want to chat about real life things too often. Food always works. These are awesome tips. I think food plays an important role. Haha this is awesome!! My brother is exactly like this right now and my mom is constantly asking me "HOW DO I GET HIM TO TALK MORE?!" Food is the top contender for sure. My teenage grandson is really into sports so all I have to do is mention shooting hoops outside and he's all over it. Of course, food is always a great way to get a male teen to converse. It's really important that you're aware of their interests so you can easily start a topic and get them talking in now time, lol. I think these are awesome tips for parents, also, food never fails! I love your post! I often brainstorm things to talk about with my nephews who all are into sports and reading. I love to read, but they read mostly fantasy stuff. We manage, but next time I am bringing food. Funny how food always brings everyone together, that includes male teenagers. One way to get them to talk. LMFAO! OH MAN. It will be funny when the day comes when I actually have to take these notes into use! ;) Food - FOOD is always good! Yes WDW is great but sure is pricey. I learned from my oldest the most effective way to have any meaningful conversation was never head on for example at a table with food. It was and has always been side by side. Yours is really a unique idea to fill the generation gap that separates our sons from us. Thanks for sharing. Oh boy! I don’t have boys but I have nephews and I will for sure remember the food. It’s hard to connect with them sometimes. Haha these are some great tips I have to admit food often works with my other half as well! These are wonderful tips. Food typically works for me all of the time with my son. This is really awesome. 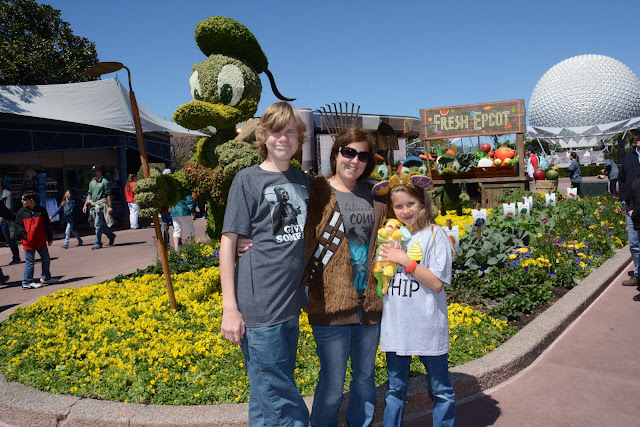 I have one pre-teen boy and a teen daughter. 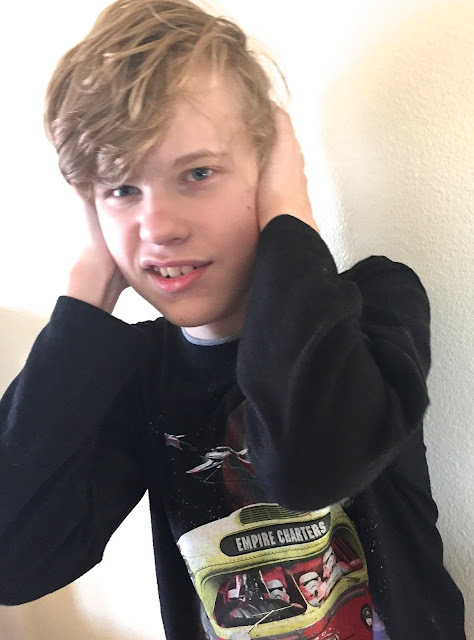 I know that my pre-teen boy has never been much of a talker, unlesssss I get him on a subject that he's passionate about and then he could talk for hours. Love your tips ! Boys sure can be fickle. This is a really great post for struggling parents! Thank you so much for sharing this! I am going through this with my son right now! This is such a great post! My nephews are currently pre-teens and I can't wait to use some of these tactics on them, LOL!! Great post! Food seems to work for men all ages! Teen age years are the hardest but the most important ones to shape the adults they will become. I applaud you for trying to spend time with him as much as you can. Oh bless your heart! Boys are a strange creature for sure! Thank you for sharing with us! Thanks for sharing these amazing tips. My kiddo is a little too young for this but I'm sure these will be helpful later. This is very true! I have a 16 year old nephew that is hard to connect with, but one you bring up food or his favorite place to go hes all ears.